I wrote this review many months ago, and somehow it got lost in the shuffle of my Flickr page (by the way, for new readers of The Pen Addict, you can find all of my photos right here). The Pentel Hybrid Technica is what I like to classify unscientifically as a basic pen. No fancy features, no Super Ink, nothing other than a good working pen that you can break out and just go to town with. The Pilot G-2 falls into this category for example, as does the Pilot VBall RT. What I look for in a pen like this is really just ease of use. Can it get the job done without annoying me in some way? The Hybrid Technica comes thisclose, but there is one minor issue I can't overlook - the grip. The issue here is that the grip is not attached to the pen, via adhesive, or any other way. I know other pens do this as well, but this one seems especially slick, so much so that the grip actually rotates as I write. It is like I am at one of those rotating restaurants at the top of a fancy downtown hotel or office building. Here comes the pen clip...and there it goes again. Big Ben, Parliament. It is a really odd felling. I'm sure I could add some super glue myself if I were so inclined, but I have enough other pens to choose from thank you very much. 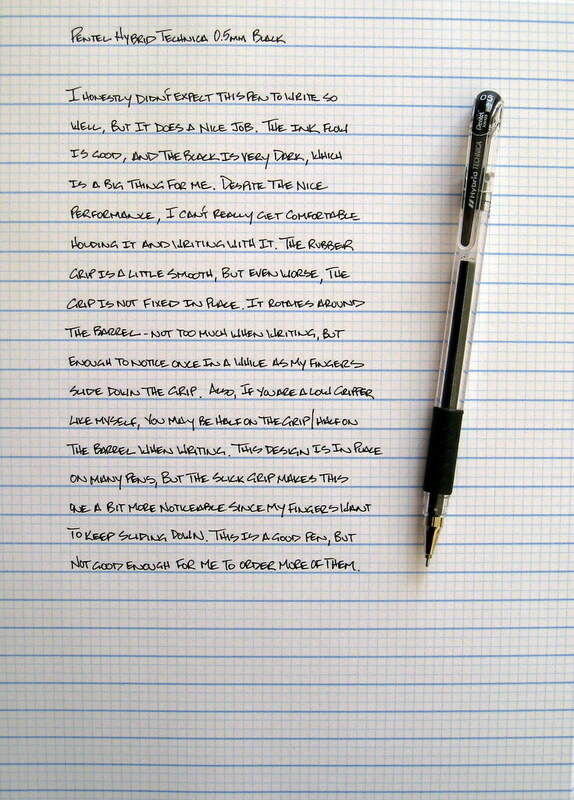 It's too bad really, because this pen writes very nicely and I would love to use it more. Posted on March 5, 2010 by Brad Dowdy.